To receive this report via email, please click here. Despite criticism from the High Court of Justice, this week the Prime Minister’s office finalized the appointment of settler leader Pinchas Wallerstein to head a government team tasked with leading the process of retroactively legalizing illegal outposts across the West Bank. As FMEP reported when Wallerstein’s appointment was first announced in late October 2017, Wallerstein has been prosecuted for knowingly violating Israeli law by building a sewage plant near the Ofra settlement on private Palestinian land; has admitted to issuing forged building permits for settlement construction without the authority to do so; and has admitted to lying (again) to government authorities to expedite the construction of the (since evacuated) building the Amona outpost. The team Wallerstein will now lead is tasked with developing legal cases – likely based on new legal precedents and opinions (here, here, and most recently here) established by Israeli Attorney General Avichai Mandelblit that support the appropriation of private Palestinian land for a public good – to “regularize” outposts (i.e., convert outposts built in violation of Israeli law into official “legal” settlements). The government has already begun to the lay the groundwork for Wallerstein’s work: a leaked recording that surfaced in mid-January revealed that a small team within the Defense Ministry has spent months identifying 70 outposts across the West Bank that it believes can be retroactively legalized. With this appointment, Wallerstein — who has worked full-time to strengthen settlements since 1979 — will lead government-backed effort to shape the ever-evolving legal mechanisms for justifying, in the eyes of Israeli courts, the appropriation of as much private Palestinian land as possible in order to expand and entrench Israeli settlements and outposts. And notably, the legalization of these outposts will mean, in effect, that while for years Israel committed to not establish new settlements, new settlements were in reality being established continuously through unofficial means. This week, the High Planning Council of the Israeli Civil Administration (the arm of the Israeli Defense Ministry that is the sovereign over the West Bank, governing all aspects of life) advanced several plans to expand settlements and outposts across the West Bank. A plan to build a hotel and race track for tourists in the Jordan Valley, near the Petza’el settlement (approved for deposit for public review). A plan to build a gas station and school in the outpost of Mitzpe Danny, located east of Ramallah, in the middle of the West Bank (approved for validation). A new outpost to “temporarily” house mobile homes for the residents of the Netiv Ha’avot outpost (approved the validation) – more below). 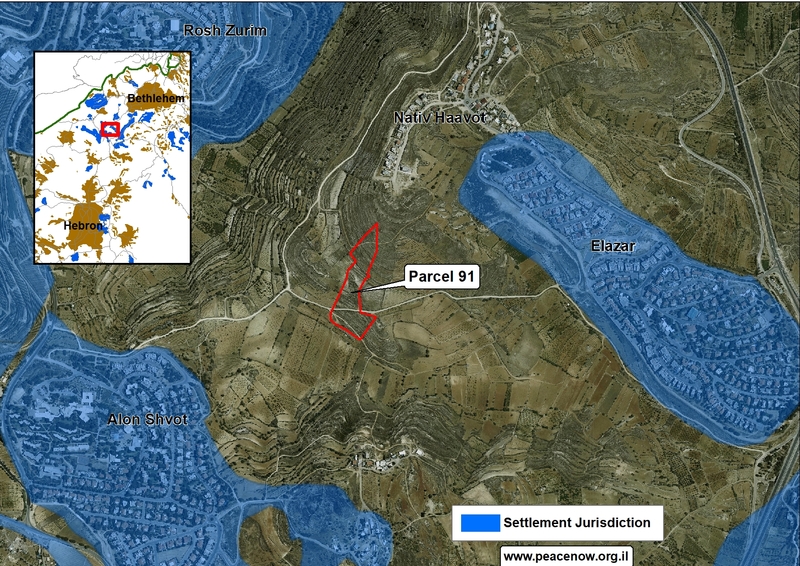 A plan for 68 new units in the Elazar settlement near Bethlehem (approved the validation). A plan for a new cemetery to be located south of Qalqiliya (discussed but decision to deposit for public review postponed). The Defense Ministry tried to minimize the significance of these approvals, calling them “non-residential” or “less significant,” because the High Planning Council is only supposed to convene a few times a year, per a reported agreement with the United States. The High Planning Council met once already this year, and is not due for another (what the Defense Ministry might call “significant”) meeting until April. As noted above, the High Planning Council this week approved the validation of a plan to establish a new settlement site to “temporarily” house residents of the Netiv Ha’avot outpost who are facing a court-ordered eviction from Netiv Ha’avot because the outpost was built without permits, and sits partially on private Palestinian land. The plan moved ahead after Israeli authorities dismissed an objection brought by Peace Now and Palestinian residents of the village of Al-Khader, whose land the plan affects. According to the approved plan, Israel will place 15 mobile homes at the selected site — connected to Israeli water, power, sewage, roads, and other infrastructure — located near, but not within, the borders of the Alon Shvut settlement. When the High Planning Council initially approved the advancement of this plan in October 2017, it noted that “the plan is improper, but we will have to approve it as a temporary solution.” At the time, the Council ordered the government to go about expanding the borders of the Alon Shvut settlement to include the land. Because the mobile homes will be put on land that is outside of any settlement border, the plan in effect creates a new outpost. Under the approved plan, the new homes will be allowed to stay in that location for three years. However, based on past practice, it can be expected that within that time, or at the end of those three years, the site will “regulated” by Israel to become a permanent area of Israeli settlement. FMEP has covered the many unfolding storylines in the Netiv Ha’avot drama repeatedly and in detail, but as a reminder: in 2016 the Israeli High Court of Justice ordered the demolition of the Netiv Ha’avot outpost. As of now, 15 structures in the outpost are scheduled to be demolished next month, though efforts are still ongoing to save the structures from complete demolition. High ranking officials in the Israeli government, including Yesh Atid’s leader Yair Lapid, have supported the outposts campaign not only to save the 15 structures but to retroactively legalize the entire outpost. If the latter campaign succeeds, it will mean that the newly approved mobile home site will be available for additional settlers to inhabit for at least three years. The Knesset this week passed a bill that extends the state’s jurisdiction outside of its borders, bringing colleges and universities in settlements under the authority of the Israeli Council for Higher Education, among other things paving the way for establishment of a medical school funded by US settlement backer (and key Netanyahu and Trump supporter) Sheldon Adelson. FMEP previously reported on this bill and its implications on Feb. 1, 2018 when it passed first reading in the Knesset (a signal that the ruling coalition had approved its passage). Though limited in its direct impact, the bill’s authors and supporters have effectively created the rhetorical and legislative space in which the extraterritorial application of Israeli law is no longer questioned, nor is the ultimate end goal of annexing as much West Bank land as possible. Unsurprisingly, the Trump Administration offered no criticism of the move. Prime Minister Benjamin Netanyahu this week intervened to block a vote in the Israeli cabinet on whether to lend government support to a bill in the Knesset that seeks to extend Israeli domestic law to “areas of settlement in Judea and Samaria.” The bill is modelled on a resolution adopted in January, with Netanyahu’s support, by the Likud Central Committee. That resolution calling for the formal annexation of the settlements. In explaining his decision to block the vote at a Likud faction meeting, Netanyahu pleaded with his party to hold off on settlement annexation while he coordinated the matter with the White House, stating that he has been in discussions with the Trump Administration about “applying sovereignty” to the settlements for “some time.” A White House spokesman for Jared Kushner (who officially leads the Trump Administration’s Israel-Palestine peace efforts) strongly denied that the U.S. had engaged in any discussions with Israel about plans to annex the West Bank. The statement did not weigh in on those plans, instead reaffirming the U.S. commitment to brokering peace. Reportedly, U.S. officials privately told the Israeli government to put out a correction of Netanyahu’s statement and a senior Israeli official later released a statement partially walking back Netanyahu’s claim, suggesting instead that Netanyahu has kept the U.S. informed about various proposals in the Knesset (there are several annexation proposals that have already passed and some that are still pending). Ignoring the kerfuffle, several MKs called on Netanyahu to ignore U.S. statements and proceed with annexation. Ir Amim reports that the Jerusalem Local Planning and Building Committee met last week to privately discuss three plans for new East Jerusalem settlement projects, all on the Mount of Olives. The three plans were all drafted by the head architect of the Elad settler organization [learn more about Elad, here]. The meeting was an attempt to circumvent the standard planning process that governs construction projects in Jerusalem – a process which requires public hearings. 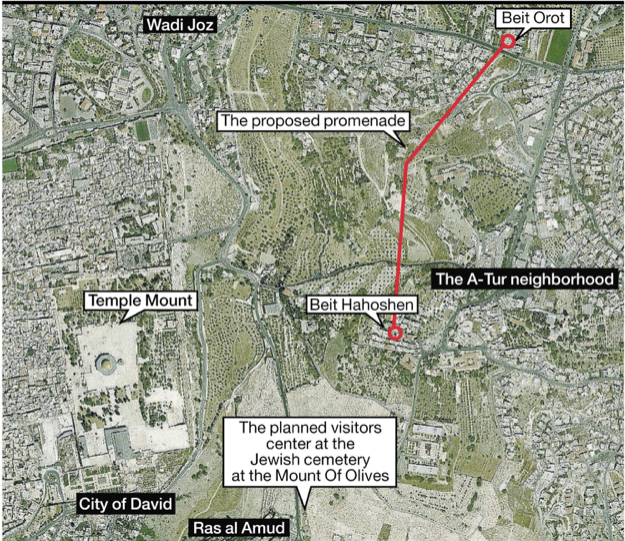 Two of the plans relate to the proposal for a new promenade connecting two settlement enclaves (Beit Orot and Beith Hahoshen) located inside the Palestinian neighborhood of A-Tur, the construction of which will require the expropriation of private Palestinian land. FMEP has long been a trusted resource on settlement-related issues, reflecting both the excellent work of our grantees on the ground and our own in-house expertise. FMEP’s focus on settlements derives from our commitment to achieving lasting Israeli-Palestinian peace, and our recognition of the fact that Israeli settlements – established for the explicit purpose of dispossessing Palestinians in the West Bank and East Jerusalem of land and resources, and depriving them of the very possibility of self-determination in their own state with borders based on the 1967 lines – are antithetical to that goal.